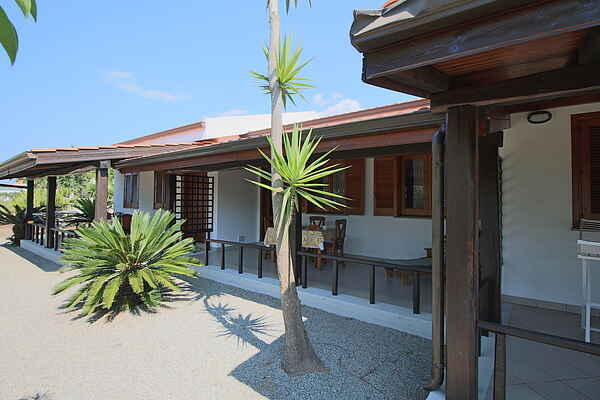 This lovely residence with 18 apartments is located in a beautiful part of the coast of Capo Vaticano. There are 11 apartments on the sea and seven apartments are slightly higher divided into two buildings. Apartment Speria lies with two other apartments at 50 meters, about 250 meters from the sea. You have from apartment Speria stunning views over the sea and the coast. Tropea, also called the "Pearl of the Mediterranean", is just 7 km away and the station in Ricadi is within walking distance. The residence is located in a beautiful landscape of wild cliffs, coves and beaches. During the day and at sunset you have a breathtaking view of the sea, Aeolian Islands and Sicily. The residence has a private beach an a beach bar where you can eat delicious salads with fresh vegetables from their own vegetable garden. You can use the beach chairs and paraols. The friendly owner and his family are always present. Ask them to fun excursions and restaurants in the area. Walk to "belvedere" of Capo Vaticano and admire the beaches "Praia you Focu" which are only accessible by sea. There are several pizzerias and beaches reachable on foot. Book an excursion and visit the Aeolian islands of volcanic origin.